Jake is available to come to your school, place of work or event. Jake’s presentations are upbeat, interactive, engaging and entertaining, and include a comprehensive display of native and exotic plants and an in-depth description of some of the plants uses. Jake will share information on how to make rope from tree bark, fire from sticks, soap from Wattle leaves and much more. Jake's day courses and bush walks will take you on a journey of discovery that will change the way you look at the Aussie bush forever. Jake is available for 3 hour bush walks or day courses that run for approximately 4 to 5 hours. The course focuses on bushcraft, and identification of edible & medicinal native & introduced plants. Prices start at $65.00 (per person). ​The Weekend Experience will take your learning to a whole new level. Learn to implement the fundamentals of tracking, bushcraft and foraging from one of the Australia's most experienced teachers. This is arguably one of the most comprehensive courses for edible and medicinal, native and introduced plants in Australia. Prices start at $350.00 (per person). This event sold out in two days. Very sorry if you've missed out - Please keep an eye out on this page and Embrace Healing for future workshops and walks with Jake!! 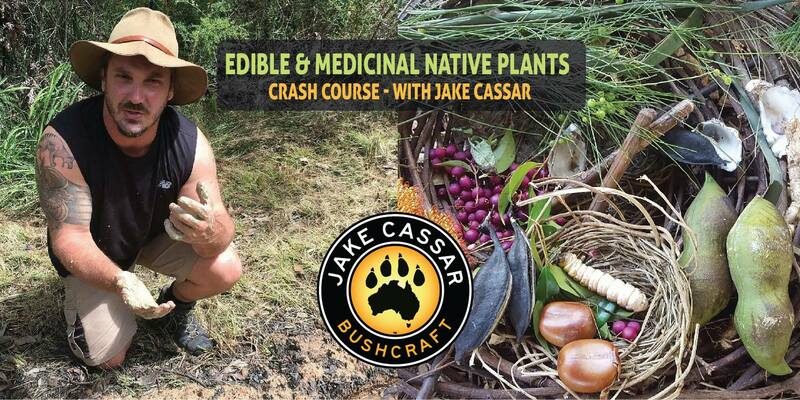 Edible & Medicinal Native Plants - Crash Course with Jake Cassar! Proceeds go towards supporting our nearly extinct local Koala population and purchasing motion detection cameras. This is a very unique experience and for those that know Jake or has been on one of his educational walks, will know just how much knowledge, wisdom and passion that he packs into such a short amount of time. Jake will start with an introduction to his important conservation work, before taking the group on an epic bush tucker walk to show us how wecan all survive by living off our incredible native and introduced plants! NOTE: Maximum 20 adults (over 16s only, sorry no children). The last walk sold out in a day, so please click on the ticketing link to secure a spot. Location to meet: West Gosford (exact location will be sent after ticket is purchased). Lunch: Bring your own snacks to eat - there will be a short lunch break. To bring: Food, water, camera/phone, notepad & pen. Cost/donation: $55 + booking fee* (proceeds go towards Jake's environmental work). *We are unable to refund any tickets that have been purchased due to relying on numbers and cost to make these events sustainable. However, if we need to cancel the event because of bad weather or unforeseen circumstances we will of course refund all paid tickets (after booking fee). Please note: The location is not easily accessible by public transport, therefore coming by car is strongly recommended. If you are interested in #wildfood, #bushsurvival, #urbanforaging or #medicinalnative and introduced plants (weeds) make sure you get along to this interactive and engaging walk. Jake Cassar has spent over 20 years doing annual survival missions where he lives of only what he can hunt, catch or gather for weeks at a time. This experience, mixed with Jake's incredible knowledge of wild plants and their uses, makes this a walk not to miss. A political activist know for some huge environmental wins including creating new #NationalParks on the #CentralCoast, Jake will take you on a journey of discovery that will change the way you look at the Aussie bush forever.